Self-Publisher’s Showcase: Today we are joined by G.R. Wilson, author of “Outsourced World”. Welcome to the Showcase Lounge, Glyn. GRW: Difficult for me to “tell a little about myself” because there are so many caveats and changes of life-direction. So I shall embark on a short meander if you don’t mind. De-colonization, mass immigration, radical feminism, financialization, ‘pornification’, huge technological transformations (e.g., computerization and digitalization), de-industrialization, globalization, and now forced racial mongrelization. All of that inside 50 years: a breathtaking and wilful series of socio-economic and cultural experimentations, premeditated despoilment, wanton disruption, coupled with endless volatility. Especially since 1971. Here’s a representative cameo for you. I was born in the Wirral, in the English county of Cheshire. As I and my contemporaries were about to leave school this region was still prosperous, with jobs a-plenty and a stable and homogeneous population. But by the 1980s it was heading towards a kind-of Chicago melt-down, with mass company closures and bankruptcies coupled with the whooshing sound of rapid depopulation. The de-industrialization of the British economy hit my home region very hard because it (once) contributed disproportionate wealth to the national economy throughout those many decades when Britain ruled over its own global trade arrangements and international relations. I suspect those born in or near the city of Birmingham prior to 1960 will also be nodding their heads in shared recognition. Manchester, Tyneside, Cardiff, and Glasgow also. By the early 1990s, which chronologically corresponds to my career peak, much of northwest England was already being propped up by European (E.U.) re-development grants issued by the unelected Gnomes of Brussels. A huge and depressing transformation. So I would say I was placed onto an unexpected life-trajectory due largely to a series of artificially imposed mutations. There are surely many others (on either side of the Atlantic) who were forced onto a similar helter-skelter ride. Change hits us all at sometime in our lives, but certain generations even harder. Surely what is key is the age at which we must face each tsunami wave of change. If you are in your early teens and still at school then you’d be pretty well insulated from drastic change. Similarly if you are already elderly. For example, “Radical Feminism” began its rapid ‘takeover’ of British society when I was just starting out my working life (age 17) and therefore at the very time I was just starting to look for a young woman to marry. By the time I was emotionally ready to settle down (mid-twenties) feminism had already corrupted and/or subverted the entire gender equation in Britain. And unlike many of my contemporaries, I was never going to acquiesce and accommodate such errant and perverse social-engineering. And the de-industrialization of Britain (Thatcher-epoch) arrived just when I was entering those years when most men are supposed to be hitting their stride in both their career and social impact. Then, just ten years later when I was at an age when I should have been consolidating my wealth, I instead got ‘clubbed over the head’ by a national and regional property price collapse that sent me deep into negative equity, vis-a-vis mortgage commitments. And to be honest I have never truly recovered from that experience. There is no longer any doubt. Between 1945 and 1965 the lunatics grabbed full control (more or less) of the Asylum. It is a shame the majority have been deluded into believing such perversities and disruptions are normal. As regards my sub-generation’s “wild ride”, the synchronization pattern is quite marked. Believe it or not I had failed to fully appreciate the extent of this synchronization until I began responding to your interview questions. Perhaps I have just identified a viable topic for a new book? We shall see. So to get back to addressing your opening question more specifically … I basically commenced my adult life with a Unilever Apprenticeship, which thankfully equipped me with a broad set of reliable and persistent skills. Upon completing my technical training I eventually became a qualified Engineer, specializing in Process Control and Automation. I commenced my globe-trotting, ‘gypsy’ existence when in my late twenties. After working for British Nuclear Fuels during the 1970s, I somehow managed to escape the moribund yet soon to be financialized UK economy to work in the Eastern Province oilfields of Saudi Arabia (and also in a very dusty Abu Dhabi) during the early 1980s. The chance to earn tax-free income simply could not be turned down. From the mid-1970s I had been an early house-owner but was never able to afford a new car, take a proper holiday, or buy decent clothes. Inevitably, my ability to attract the kind of women I wanted (or deserved) was being negatively impacted by all this. So frustration and an increasing desperation compelled me to seek work overseas. Actually, it was a relief to get away from a society that values Estate Agents (Realty Agents) above Professional Engineers. To my delight, I soon found that my desert income was sufficient to empower my sudden thirst for exotic world travel. 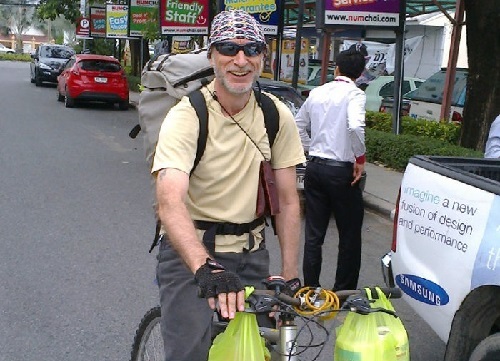 Inevitably I ended up visiting Thailand – well before the average person had even heard of the place – followed by the Philippines, Singapore, and much later, Malaysia. Later in life (when aged 40) I won a Master of Science degree in Artificial Intelligence with a top UK university. I was the eldest in class by 10 years. But as I graduated with my fresh MSc, yet another economic recession (during John Major’s Premiership) was already suppressing Britain, and the Western World generally. Elsewhere, meanwhile, such as in SE Asia and the Middle East, a fantastic construction boom (set to last about 25 years) was just getting started. During the early 1990s, my own society suddenly started categorizing any white male aged over 40 (even over 35) as “over the hill” and too old for the “future economy” … whatever the hell that was supposed to mean. Irony of ironies: now aged 40+, but armed with a fresh MSc Degree and years of senior experience on major energy projects, I still could not find employment in my own country. So I ended up back in Saudi Arabia (yet again) … this time teaching native employees of a major power generation & distribution company how to become better technicians/engineers. To sum-up … between 1980 and 2008 I visited 24 countries, and worked in 9, including Jamaica, Libya, Iraq, and India. The book title that triggered this interview records my transfer (escape) from Saudi Arabia to Abu Dhabi, followed by my subsequent arrival in India on contract to Enron, during 1996. I now live in Thailand where I perform all my writing work while dressed like a Hong Kong or Singapore ‘Coolie’ of old, in room temperatures that reliably exceed 27 degrees Celsius. Anything cooler and I’d be better off buying shares in Thailand’s Electrical Utility company! Some would wish to categorize me as an “expatriate”. But I prefer the adjective, “exilic” (someone who is living in exile). A term or label that I argue is rather more meaningful, and thus accurate. SPS: You recently released Outsourced World. What can a reader expect from your narrative chronicles? GRW: A good question. The short answer is they can expect something “out of the ordinary”. Our world, specifically that part of it which we call “The West” has long been in the grip of conspiratorial entities made up of secret societies, hyper-wealthy banking dynasties, and zealots from a certain religious group whom we are not allowed to criticize. Various historical documents show that this has been the case since the mid-19th century. Just prior to, and during World War Two, and for their own mutual benefit, they clubbed together to (secretly) set us all on a path where (they hope) all nation states will eventually be subsumed into regional trade blocks (e.g., NAFTA, EU, ASEAN, AFTZ, and MERCOSUR), and where individuals such as you and I will be subsumed into the Hive Mind or great “Collective” … to then be governed by social media, subcutaneous chip implants, the constraints of a “one-world” currency, and our meek dependency upon “the State”. Yet another way our psychopathic conspirators plan to enforce this mental imprisonment is to render all employment outsource-able to the lowest bidder, which is where my book (esp. Book-1) offers to help its readers the most. During the mid-1990s, I was among the first to be fully exposed to the new initiatives thrust upon an unsuspecting world by this ad-hoc cabal of Über-rich megalomaniacs and globalist fanatics. One key event (as I go to some lengths to explain in my book) is the formal arrival of the World Trade Organization (WTO) on 1st January 1995. As I narrate my personal experiences, difficulties, and sense of foreboding, I explain to my readers what changed in our world between 1990 and 1996, and why those changes still influence our existence today. I argue that understanding the 1990s properly has now become crucial to comprehending our present predicaments. One goal of my book is to disseminate that new understanding. SPS: Was it always your intention to focus particularly on Outsourcing when you first began the outline, or did the book evolve as you went? GRW: It largely evolved as I went along. Outsourcing has only come into proper focus during the past 10 to 15 years. In passing, I should emphasize to your readers that Outsourcing and Offshoring are two very different practises. The Offshoring of the West’s manufacturing activity to Asia started long before the Internet (which would later facilitate so much Outsourcing to India). Offshoring was originally promoted by David Rockefeller following his early visits to China alongside his offer of banking agency (Chase Manhattan Bank) to major Soviet Union banks. So you see it took just one rich, New York crook with international contacts, to get the entire ball rolling. SPS: Who would you say that the book is perfectly suited to? GRW: I did not write my book with any particular audience in mind. I simply set out to write an honest account of my experiences in the most entertaining way I could manage. I hope my intense effort will one day benefit enough of my readers to render it all worthwhile. Both this first book and its sequel would surely appeal to all those who have travelled outside of the West, and in the proper sense of the word … meaning not as a tourist but by fully exposing themselves to an alien culture. It should definitely appeal to anyone who has worked in the Persian Gulf region. And also to anyone who is aged over 55 years because they would most accurately recall the time-line my book is bracketed by. And I would like to think my Outsourced World series would strongly appeal to all those seeking true and reliable explanations for our descent into relative joblessness, where even a simple banking inquiry is now being attended to by people sitting on a chair somewhere in India. A perverse concept that would once have only made sense in some early Star Trek episodes. SPS: Are there lessons that you believed a reader can learn from in your work? GRW: I would say there are four sets of lessons that could end up influencing many of my readers. The first is the evidence I provide that suggests most so-called “conspiracy theories” pertaining to “One World Governance” topics are in fact conspiracy fact. Which in turn underlines the urgency of helping many more of us to “grow up” so that ever greater numbers gain the capacity to see the world as it truly is, and not as CNN or the BBC (et al) would like us to see it. The term “living within a Matrix” is not as far-fetched as many prefer to assume. The second lesson derives from my very intimate interactions with two young and highly attractive Muslim women I met while in Kuala Lumpur … and all those considerations that flow outwards from that “mature content” topic. A hugely memorable experience I have unashamedly described in explicit detail. In other words, there are about 6 pages in Book-1’s narrative which are certainly not suited for persons under the age of 18. The third is the way in which the First Gulf War was purposely and cynically used to alter (or destroy) the future prospects of all Westerners who had hitherto enjoyed (unchallenged) a full decade earning a very decent living throughout the Persian Gulf region. And the fourth lesson is that which can be inferred from my own conundrums faced because of massively altered circumstances in a region I had hitherto felt very comfortable in, and where I (and my ilk) had previously been esteemed in. I suggest in my book that such negative transformations in group status are never accidental; they are driven by someone’s clandestine political agenda mixed with slander and defamation. This corrosive meme is now evidenced by the faux popularity of social and political science curricula (throughout Western Academia) that has adopted a scathing attitude towards the entirety of Western Culture, and hostility towards the “dreaded White male”. SPS: Would you say it was a cathartic process, getting your experiences down on paper? GRW: Not on this particular occasion because this is not my first book. And also because the core of my Outsourced World narrative was originally published in three parts during late 1999 and early 2000 in a now defunct magazine called Nexus: published monthly to Members from 1989 until circa mid-2015 by the Expat Network, out of Croydon, Surrey, England. SPS: How did you feel when the work was complete and you finally published? GRW: I guess I felt just the same as most other authors of non-fiction books … thoroughly exhausted! And I have evidence! Back in mid-April 2017 I made a Vlog of myself while in the middle of editing my Manuscript, and one can see the stress and exhaustion etched into my face. This first book in my three-part series was a massive challenge; not only because of the huge amount of factual material I had to back-up with citations, outboxes, tangents, and outlinks. I also had to constantly think ahead about Book-2, and about porting with those social media channels not yet established. Thankfully my book-support website on the Tumblr network remains stable, strong, and looking good. But a social media account on MeWe had to be cancelled (scrubbed) because I belatedly discovered it was not being adequately supported by its owners. Out of the blue, my December 2016 created MeWe account (MeWe functions like a privacy-centric Facebook account) started to suffer strange technical malfunctions. After 3 weeks these issues remained unresolved. So I cut my losses and closed the account. I am now on Steemit and Google+. SPS: Have you left room to expend into a second volume on the same subject? 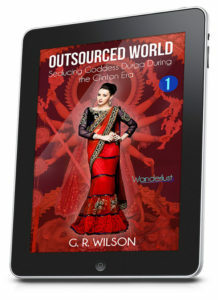 GRW: To present the entirety of my 1996 experiences, Outsourced World started out as a single volume. But once I had interlaced sufficient background discussions to my core narrative, it soon became unwieldy. Few readers are looking to purchase an ebook comprising around 400 pages. So I obeyed market sentiment and split my project into two. So yes, I have indeed expanded into a second volume and this will (hopefully) be completed during August 2017. The dividing line between Book-1 and Book-2 also happens to be a natural one. Book-1 describes my eclectic experiences of the UAE, Malaysia, and England; while Book-2 is dedicated to my work and travelling within India, as well as a surprise development regarding Durga. SPS: What do you think a reader will take away from completing your work? GRW: As regards Book-1 (Wanderlust) there is a good chance a sizeable minority (at least) of my readers will experience a “wake-up-call” or an epiphany. In that first volume I believe I have joined enough disparate dots to allow certain chronic issues to be placed into proper focus. Book-2 (Nirvana) offers a candid and often-times raw explanation of India’s realities. Superficially, India will have changed somewhat since 1996, but its underlying aura will have remained the same. The construction of shiny new buildings and airport upgrades are never going to alter the mindset and daily experience of a sub-continent, especially one as densely populated as India’s. And finally, Book-3 (Durga) will be a relatively minor affair where I intend to tell the back-story of the South Indian beauty I met while in Saudi Arabia. And whose name of course graces this series’ subtitle. There are a few other lessons to be learned from that third story, which some of my readers will likely appreciate and thoroughly enjoy. Hint: It is difficult to convey the joy and satisfaction of having a passionate affair with beautiful woman who can wear a Sari (and all its delightful accoutrements) to absolute perfection. SPS: Have you picked up any lessons in writing your first release that will help you in planning/executing further work? GRW: Yes indeed. For example, the way in which I collate and organize research material has been greatly improved. The composition of book covers was a massive learning curve. And the ways in which I now look to promote my written work. These are my most significant early lessons I think. SPS: What do you have planned to follow on from Outsourced World as a second release? GRW: As a second release I already have a work-in-progress on disk; a project that was commenced during late 2015. It is set in the Philippines: another country I have visited more than once. I cannot give too much detail away at this point because I am far from being the only person who could write such a book. SPS: You are very well-travelled. Do you feel this has been a key factor in the type of writing that you have produced? GRW: Absolutely. My many travels have been crucial. I predicate most of my writing upon some first-hand experience. In fact, much of my travelling was motivated by a strong thirst for unique insights and “author data”. Furthermore, I would now go so far as to say the 1990s was probably the last decade in which any self-sponsored traveller could go “wherever his nose led him” without undue penalty or loss. Future historians will likely view the 1990s as the last decade where any Westerner could experience any significant venue in its authentic state: untouched by globalization, United Nations’ planning, or rampant tourism. Today, once you’ve passed through one major international airport, you’ve essentially passed through them all. And also today, there is very little of any substance (apart from dialects) to distinguish Dubai, from Singapore, from Bangkok, from Manila, from Brisbane, and from Hong Kong. GRW: Thank you very much for giving me this opportunity to communicate with your attentive audience. Before closing I would like to take a brief moment to express my sincere appreciations for those many efforts the Self-Publishers’ Showcase makes on behalf of independent authors such as myself. Long may you thrive.